Ian Davison is Managing Director of Earthmoves Ltd., which he co-founded in 1999. Ian received a First Class honours degree in Earth Sciences from the University of Leeds before completing his PhD on Malian Precambrian mobile belts at Montpellier and Leeds Universities. After this, he joined the British National Oil Company in Glasgow for three years where he was involved in International Exploration in NW Europe. He then decided to take a break from the routine and moved to Salvador in NE Brazil where he lectured in Basin Dynamics, Tectonics and Precambrian Geology for five years. During this time he consulted extensively for Petrobras. He returned to the UK in 1989 and became a Senior Lecturer in Structural Geology at Royal Holloway, University of London, where he directed the Salt Tectonics Group. Ian has been involved with consultancy work for oil companies exploring in Brazil over the last twenty years. Ian has published over seventy papers in scientific journals and books. He speaks fluent French and Portuguese. Click here for a list of these publications. Ian is a geological consultant for Earthmoves. He graduated with a Masters Degree from Royal Holloway, University of London in 2006 and has experience in both ArcView and Manifold. He has worked in the Oil, Gas and Coal industries in both the UK and Australia. Ryan joined Earthmoves in 2014 following completion of his Bachelors Degree in Geology at Royal Holloway, University of London. He later completed a Masters Degree in Mining Geology at Camborne School of Mines in 2017, with a thesis assessing the practicality of Landsat-based spectral analysis for deposit prospecting within the Arctic Circle. Ryan holds experience in ArcGIS, Q-GIS, ENVI, and Leapfrog. 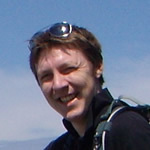 He assists Earthmoves with Digital Atlas maintenance, spatial-data analysis, and project research. Julia E. Marshall is the Administrative Director of Earthmoves Ltd. She graduated from the University of Leeds with a French and English Joint Degree in 1983. She moved to Glasgow and became an Editor for the Oxford English Dictionary. She emigrated to Brazil in 1984 to become coordinator of a group of schools teaching English as a Foreign Language in Salvador, Brazil. She returned to the UK in 1989 and was employed by Oxford University Press, before taking up her current position in 1999. Julia speaks fluent French and Portuguese.